Can yellow + Blue be White and Green at the same time, Yes they can be, learn about "pigments' and how same colored light and materials can behave differently. This animated science topic is very useful for students and professionals who want to know about science behind colors of natural objects. What is the difference between colors of light and paints ? Why do mixing of colors yields an entirely different color? The color of an object depends upon which component of light it absorbs, reflects or transmits. For example, a rose appears red because it absorbs all the colors of white light excepts red. As red is the only color reflected by the rose, therefore it appears red. 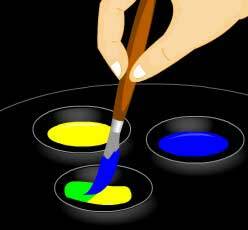 Pigment colors combine by subtractive process in which some color is absorbed before mixing of the remaining colors. Cyan, Yellow and Magenta form Primary pigments. In nature no pigment is pure. That means pigments do not absorb all the light colors incident on them. When two pigments are mixed together then the colors reflected by one pigment are absorbed by other pigment and vice-versa, except a common color, which is reflected by both the pigments. Colored filters are used to obtain light of a specific color. A transparent object, made up of gelatin or glass, which allows a light of certain color (wavelength) to pass through it and absorbs all the other colors (wavelength) of white light is called a colored filter. Want to know more, please go through the animation below..